Mars Volta, heir to the mounting interest generated by the defunct parent band At The Drive-In, assailed a capacity crowd at Roseland with a merciless wall of truly unbearable noise for two consecutive hours. I know why they didnâ€™t host an opening band. They didnâ€™t want to put the audience in the mood for music. Instead what we heard were a handful of barely recognizable songs from their two CDs interspersed with the most useless, obnoxious white noise imaginable, rendered at criminally loud decibel levels. This is the second time Iâ€™m seeing them, and I should have learned my lesson from the stupefying first Roseland appearance last year, and from the bewildering lack of music on their latest CD. What are we, the public shelling out good money for? To be punished and have out ears damaged for the sake of hearing huge screeching bursts of non-rhythmic, non-melodious noise unworthy to be the sound track of a schlock science fiction movie? 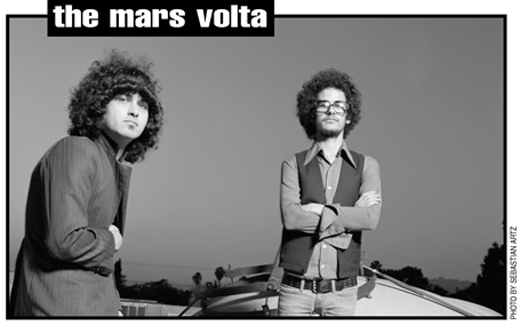 Mars Volta seems to have drunk in the enthusiasm of critics based on their promising first CD De-Loused in the Comatorium, and the undeserved welcome that the second, Frances the Mute received for its eclectic inclusion of elements of jam, hard-core, emo, Latino, experimental and electronica despite its flaunted lack of musicality . If you sit and listen to it with a stopwatch youâ€™ll notice itâ€™s about 20% music and 80% obnoxious meandering racket. There was one redeeming aspect to the show, besides being able to occasionally catch a recognizable song or two. The psychedelic backdrop was lit with the most absurd and sometimes disturbing hallucinatory images while the sextet of musicians worked their instruments with the aerobic vigor of Olympic athletes. Remember the tale of the emperorâ€™s new clothes? Emperor parades around naked, claiming to have dressed in such fine clothes that anybody with refined taste can see them. If you canâ€™t see the fine clothes itâ€™s because youâ€™re inferior.